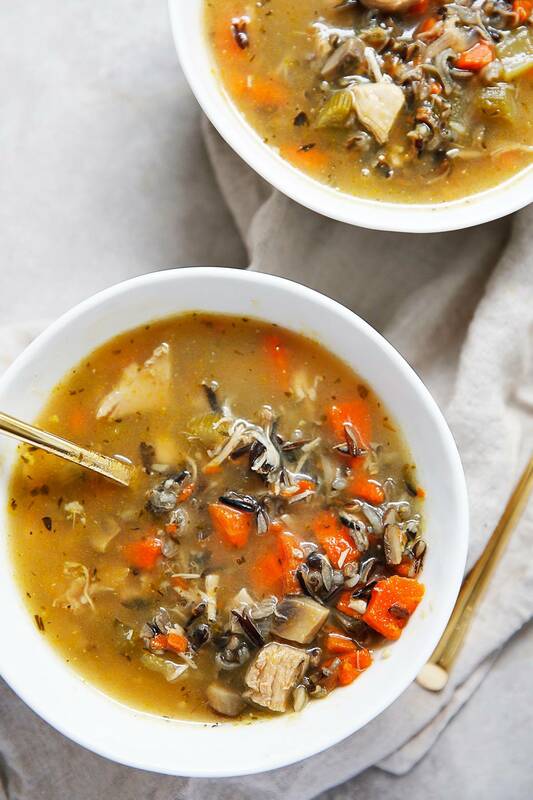 This Turkey Wild Rice Soup recipe is the perfect lunch or dinner to whip up after a great Thanksgiving meal. If you don’t have turkey leftovers, no problem because it also works great with leftover shredded chicken as well! This easy to prepare soup is full of veggies, it’s warm and hearty and so delicious! I found myself a few weeks ago with a lot of unseasonal turkey leftovers thanks to our recipe testing and preparation for all of our new 2018 Thanksgiving recipes. I whipped up this soup because Mike and I needed to eat dinner and we loved it so much I decided I should share it here! I love the heartiness and the different texture of the wild rice and that it is chock full of veggies! If you are able to utilize the leftovers of a turkey carcass to make bone broth with, like I did, it takes it up to another level! The better the broth, the better the soup so make sure if you aren’t making your own to buy a good quality brand! 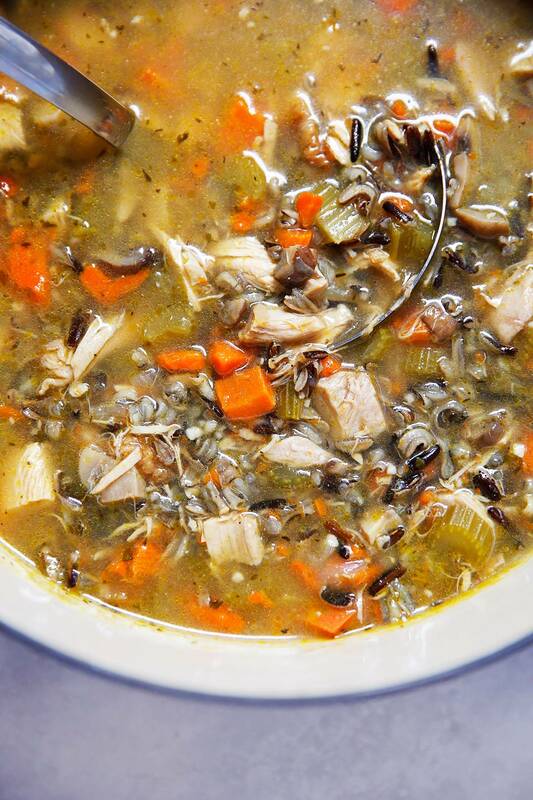 How do you make turkey soup from leftover turkey? You’ll want to pick off as much of the meat as possible from the turkey after it has been carved. If you are able to, pick all the meat from the turkey while it’s still warm because it is much easier to do! Our recipe calls for about 2-3 cups of leftover turkey meat. Once you’ve picked off meat from the turkey you should make a bone broth with it to use in your soup! Once you’ve got your meat and your broth your ready to make the soup! And we aren’t reinventing the wheel here: You saute your aromatics, add some spices, meat, rice and broth and simmer away until the rice is fully cooked through and you have a flavorful dinner on your hands! How do you make homemade turkey broth? I made a super quick turkey bone broth with the leftover carcass and it was so simple! I used the Instant Pot, of course, but you can also do this on the stove top. I put the whole carcass, a few aromatics, spices and water in the Instant Pot and cooked on high pressure for 50 minutes. It might have been the best broth I’ve ever tasted and was just so perfect in this soup. I’ve included instructions for both in the notes of the recipe if you want to make your own as well, but if you aren’t going to you can use regular bone broth or stock. For Instant Pot: Combine all ingredients in a 6 or 8 quart Instant Pot and cook on high pressure for 50 minutes. Use the natural release function. On Stove Top: Simmer all ingredients away for 4-6 hours. What vegetables are good in turkey soup? We choose to include onions, carrots, celery and mushrooms! But if you have other leftover veggies like green beans you can add those in at the very end of the cooking time just to reheat! 3 large carrots, sliced to 1/4"
In a large dutch oven or stock pot, over medium heat and add butter/oil. When hot add onions, carrots, celery and salt and pepper to the pot and cook until beginning to soften, about 5 minutes. Add the mushrooms and garlic and cook another 5 minutes. Add thyme, parsley and 4 cups of the turkey bone broth, fish sauce, and rice. Bring to a simmer and then cover and simmer for 30 minutes. Add the turkey and simmer, uncovered, another 30-50 minutes, until the rice is cooked. Taste and adjust seasoning and add more broth if needed. This recipe was developed for thanksgiving leftovers, but it will work great with leftover chicken as well! 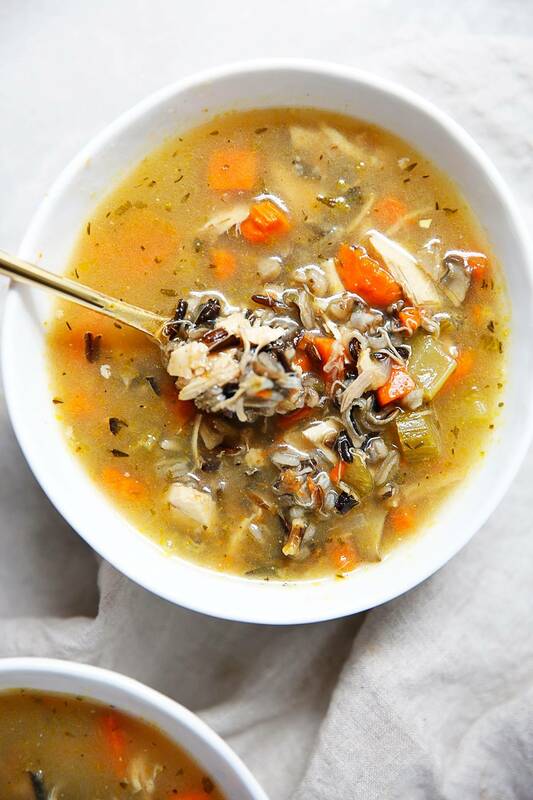 Such a cozy way to use up those turkey leftovers! Gave this one a shot with leftover thanksgiving turkey and it was SO GOOD. I accidentally followed the bone broth instructions to make the soup in my Instant Pot and it turned out great! 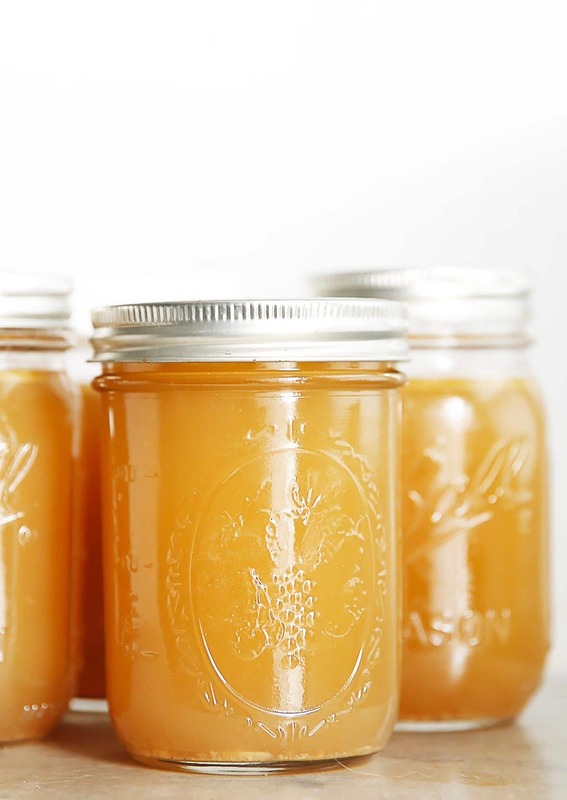 Will definitely have to try the bone broth recipe asap! I did the same thing! Often InstantPot directions are below the rest of the recipe, so I just kept on scrolling! Oops! I did think it turned out, but when I make this in the Instant Pot again, I’ll be sure to use raw chicken. Since mine had already been cooked, it ended up way overcooked with another 50 minutes in the IP. It was still delicious, and even my soup-averse husband liked it!